What Type Of Content Gets More Shares And Links? Beauty Packaging is a B2B brand intended for individuals with broad-based interests in the packaging industry. The brand content and editorial scope of the publication includes well-researched, staff-written feature articles, insightful accounts from industry leaders, industry news, new product profiles and much more. The content of every issue is also available on the web and to subscribers globally via the online digital edition. According to Matthew Gibbons, Publisher of Million Maps Santa Monica, seven companies publish nine different Santa Monica visitors' maps. Million Maps Santa Monica is the biggest, printing and distributing one million maps in ten languages through 2,400 locations. Gibbons says that being number one has its advantages, but there are some drawbacks too. "A few of the other publishers started a whisper campaign against us in the business community," said Gibbons. "They said that there was no way we're printing and distributing that amount. The worst thing was that it wasn't one of my advertisers who told me about the rumor. It was the publisher of the daily local newspaper. I knew right then and there that I had to quash these rumors, and make those competitors eat crow." Gibbons had worked with Verified Audit Circulation at several other magazines and newspapers throughout his career. At one time, ad agencies, media buyers and savvy business owners required circulation audits to provide confirmation of circulation claims by publishers. "Advertisers today have been so mesmerized by Google Analytics and other apps to track their campaigns that they've forgotten how to track print. I knew that this would be an education process, so I make the comparison. VAC is to print what Google Analytics is to the web. When you say that, they get it," says Gibbons. Million Maps Santa Monica worked with Certified Folder Display to handle the complicated distribution of the maps over a one-year period. 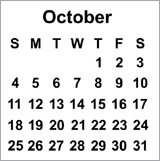 In the distribution company's 100-year history, Certified had never taken part in a circulation audit before. Gibbons, along with Verified, worked with the management at Certified to assure that their distribution roster would remain proprietary and not be used for any other purposes than auditing Million Maps Santa Monica. This establishment of trust was essential to the successful completion of the audit. Gibbons says, "My advice to any publisher who wants to use VAC to shut their competition up – do it. It works. People only talk trash about the number-one publication. Nobody bothers talking about number two or three. But being the biggest and the best does not make you invulnerable. They can attack your flanks and chip away at your margins. It's easy for them, because they're not running a big operation." "The most important thing to advertisers is ROI," stresses Gibbons. "But a close second is not making a bad decision in the first place. Providing them with hard proof – and the work and expense to get it – is more meaningful than all the 'trust me' that the competition gives them." According to a recent study by Mequoda, 69.6% of adult Americans have read an average of 2.91 print magazine issues in the last 30 days. This means that 147 million adults have read an average of 428 million print magazine issues in the last 30 days. 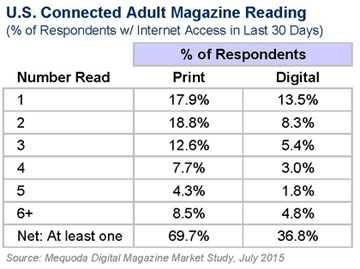 And, 36.8% of American adults have read an average of 2.37 digital magazine issues in the last 30 days. This means that 77 million adults have read an average of 184 million digital magazine issues in the last 30 days. Among U.S. adults with Internet access, 7 in 10 surveyed report having read a print magazine issue in the past 30 days, almost twice the proportion (37%) who have read a digital magazine issue, according to the study. 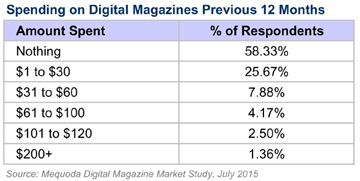 Digital magazine consumers are split on their magazine format preference. The web edition showed a tiny edge over print and tablet editions, but at this stage of the game, digital magazine consumers seem relatively equal on their preference for tablet editions versus print editions versus web editions. The most important functionalities of a digital magazine, per readers, are readable (79% very important) and scrollable text (56% very important) By comparison, far fewer perceive other functionalities such as copy and paste capability (23%) and links to websites (20%) as being very important. 42% of American adults who read digital magazines say immediate delivery is the most important digital magazine attribute, followed closely by "portable and easy to carry," "cheaper than print" and "environmentally friendly." The Mequoda results are based on a survey of 3,642 adults in the United States with Internet access. Some 53% of respondents were female, and 53% were aged 45 and older. Slightly more than one-third (34%) stated that they have household income of at least $100k. 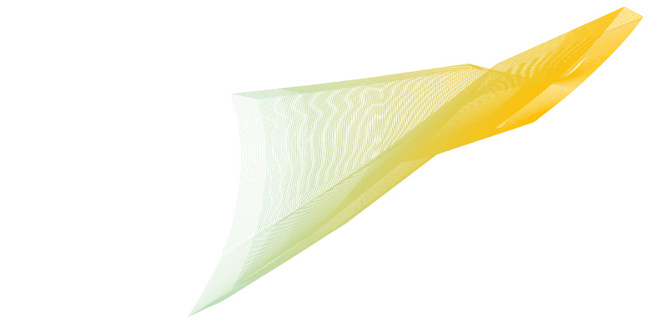 To receive the free complete report as a PDF file, please visit Mequoda.